by Merlo, Alida V.; Benekos, Peter J; Champion, Dean J. 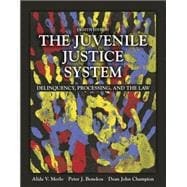 The Juvenile Justice System: Delinquency, Processing, and the Law is a comprehensive study of the juvenile justice system that examines how juvenile defenders are defined and classified and utilizes the current literature to illustrate the significant stages of juvenile processing and recent changes and developments in the field. This edition puts an increased focus on evidence-based programs that are effective in preventing and treating juvenile offenders. In addition to discussing policies and practices in the US system, examples of comparative foreign juvenile justice practice are also presented. The Juvenile Justice System, Eighth Edition makes the connection between theory and practice through numerous real world examples and connects new students to the many exciting career paths in the field. Alida Merlo is Professor of Criminology at Indiana University of Pennsylvania. Previously, she was a Professor of Criminal Justice at Westfield State University in Massachusetts. Her research is in the areas of juvenile justice, women and law, and criminal justice policy. She is the co-author (with Dean J. Champion and Peter J. Benekos) of The Juvenile Justice System: Delinquency, Processing, and the Law, 7th (Pearson), co-author (with Peter J. Benekos) of Crime Control, Politics & Policy, 2nd Anderson), co-editor (with Peter J. Benekos) of Controversies in Juvenile Justice and Delinquency, 2nd edition, (LexisNexis/ Anderson); and co-editor (with Joycelyn M. Pollock) of Women, Law & Social Control, edition (Allyn and Bacon). She is the past-president of the Academy of Criminal Justice Sciences. In 2014, she received the Outstanding Teacher Award from the College of Health and Human Services at Indiana University of Pennsylvania. In 2012, she was presented with the Academy of Criminal Justice Sciences Minority Mentor Award. In 2004, she received the Academy’s Fellow Award. Peter Benekos is Professor of criminal justice and sociology at Mercyhurst University in Erie, Pennsylvania. He has conducted research in the areas of juvenile justice, corrections, and public policy. He is the co-author (with Dean Champion and Alida V. Merlo) of The Juvenile Justice System: Delinquency, Processing, and the Law, 7th (LexisNexis/Anderson), and co-editor (with Alida V. Merlo) of Controversies in Juvenile Justice and Delinquency, 2nd Outstanding Mentor Award presented by the Academy of Criminal Justice Sciences. Dr. Benekos is past president of the Northeastern Association of Criminal Justice Sciences and was a trustee of the Academy of Criminal Justice Sciences. Dean John Champion, before his death from leukemia in 2009, was Professor of Criminal Justice at Texas A&M University in Laredo, Texas. Previously, he taught at the University of Tennessee-Knoxville, California State University-Long Beach, and Minot State University. Dr. Champion authored and/or edited over sixteen textbooks, many of them in multiple editions. For the first six editions of The Juvenile Justice System: Delinquency, Processing, and the Law, Dr. Champion was the sole author. His books focused on juveniles, police, the sociology of organizations, corrections, research methods, and statistics. Dean John Champion, before his death from leukemia in 2009, was Professor of Criminal Justice at Texas A&M University in Laredo, Texas. Previously, he taught at the University of Tennessee-Knoxville, California State University-Long Beach, and Minot State University. Dr. Champion authored and/or edited over sixteen textbooks, many of them in multiple editions. For the first six editions of The Juvenile Justice System: Delinquency, Processing, and the Law, Dr. Champion was the sole author. His books focused on juveniles, police, the sociology of organizations, corrections, research methods, and statistics.